When George says you should check out Ray's food at the Gallery, I'm certainly not going to argue - the dodoni in my fridge a testament to his persuasive abilities. 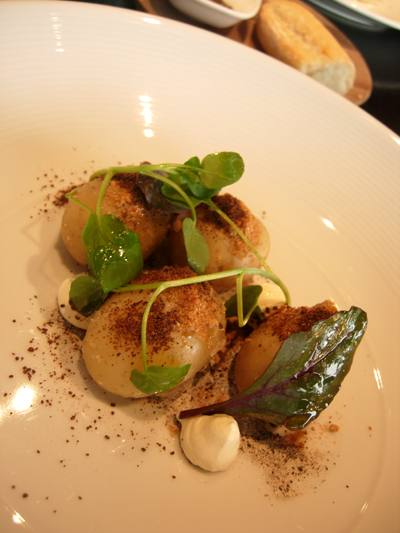 Persimmon is the restaurant located within the National Gallery of Victoria in St. Kilda Road. You have to look hard at the official site to even find mention of it. It's only open during the day (11am-4pm) but anyone can go there. 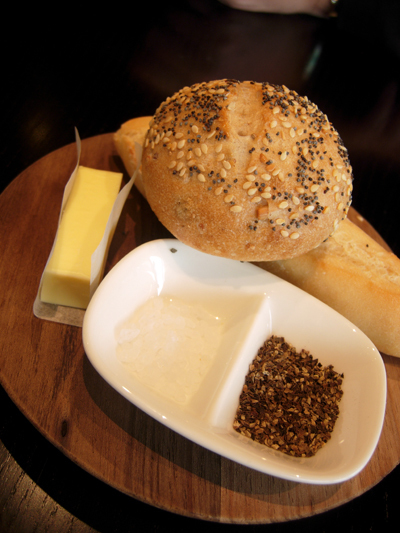 I think Paalo got a bit misty eyed at the sight of the bread tray - well, more at the sight of the butter, prepared as it was at Fenix. With such an intriguing description, I just had to order it, plus there are potatoes in it, always a positive. 4 warm potatoes, served whole and with their skin on, watercress and beet leaves, pipped sour cream and a sprinkling of a most interesting combination of flavours. Either demerera or raw caster sugar subtlety sprinkled over the potatoes coupled with a quasi coffee flavoured powder (actually it's a combination of lactose, malt, pumpernickel). 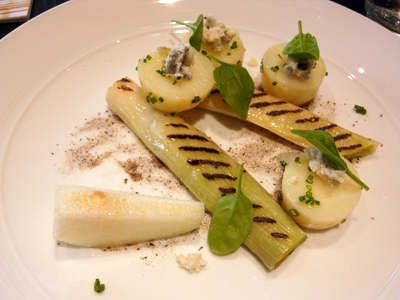 the potato here are thick slices served cold and topped with a whipped Gorgonzola and accompany two tender but warm and perfectly grilled leeks - the pear brings a refreshing, cleansing element to the dish. 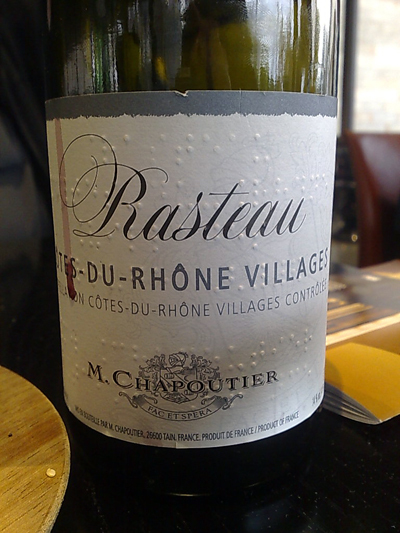 While this wasn't the Chapoutier we ordered, the Rasteau was perfectly acceptable. Cooked rare to order, a lovely tender and tasty piece of beef. 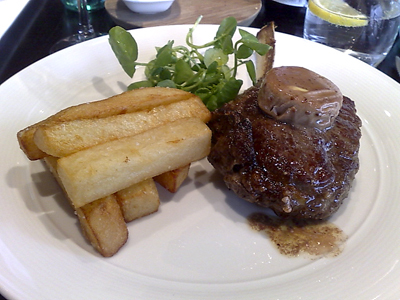 The sauce was delightful, a touch of sweetness coming through and just matched so well to the beef. This was a no-brainer for Paalo, it's been too long since he last had Ray's slow braised lamb, though at 12 hours this must be the quick version! It still had the great flavours and texture of it's longer cooked relatives. The burnt honey custard was absolutely divine and the parts of the baba that had been soaked were brilliant - the only problem with this dish was that the baba was not evenly soaked, in fact it was barely soaked. 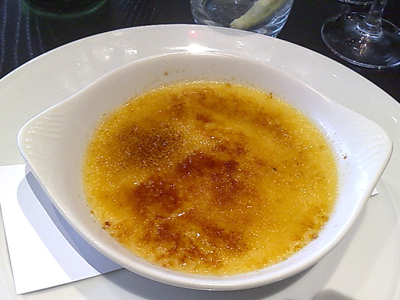 Paalo's brulee was a terrific example of the dish - full of those lovely vanilla bean seeds. 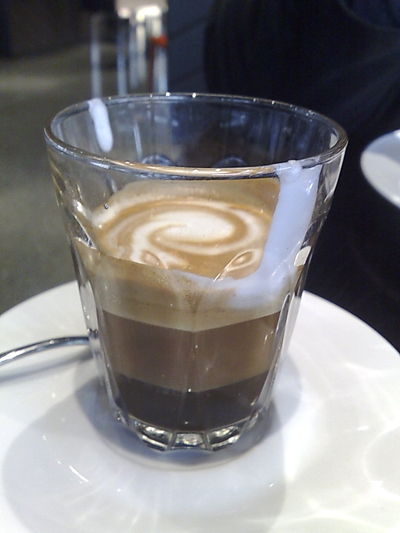 The coffee looks good too! To be fair, the service left quite a bit to be desired but I'll put up with it for the food. I'd love to try just about every dish on the menu. 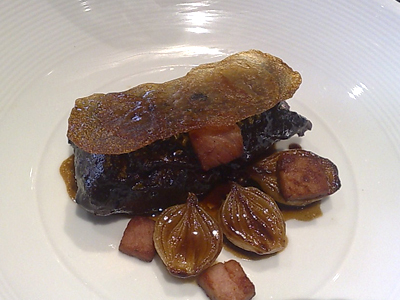 We ate at Persimmon last week, and we must say the food is fabulous. 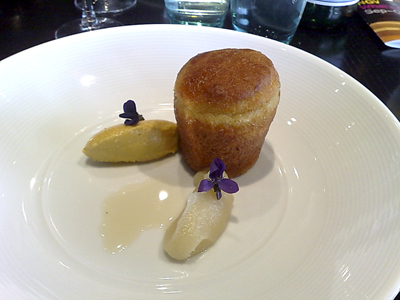 We did the full degustation menu and it did not disappoint. Food and service were on point and the food looked and tasted fantastic.